AAEON has launched the EPIC-BT07W2 SBC that supports the EPIC form factor and features an industrial-grade thermal range of -40°C to 85°C. The EPIC-BT07W2 is a fanless solution like the rest of AAEON’s EPIC line, and provides high environmental resilience with its wide-temperature design. The CPU is located at the solder side of the board to facilitate further thermal solutions, and comes with a rugged aluminum heat spreader that provides maximum airflow and temperature control. A heatsink is also available as an accessory. PCI-104 architecture expansion enables daughter boards to be stacked atop on the main board, minimizing lateral space and facilitating maximum flexibility, as well as supporting legacy IO. The EPIC-BT07W2 can be seamlessly integrated into pre-existing hardware such as panel screens and mini PCs. 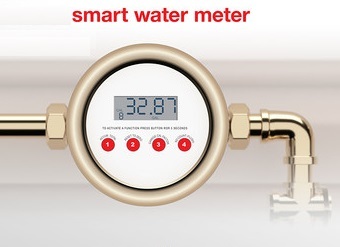 It is also ideal for IoT uses, and is designed for minimum maintenance and maximum ruggedness. Coming to your inbox tomorrow: October has a 5th Tuesday . That’s means there’s an extra Newsletter this month! The bonus topic is PCB Design. The process of PCB design is always facing new complexities. Rules-based autorouting, chips with higher lead counts and higher speed interconnections are just a few of the challenges forcing PCB design software to keep pace. 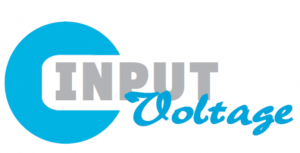 This newsletter updates you on the latest happenings in this area. Also, we’ve added Drawings for Free Stuff to our weekly newsletters. Make sure you’ve subscribed to the newsletter so you can participate. You’ll get your PCB Design newsletter issue tomorrow. Analog & Power. (11/7) This newsletter content zeros in on the latest developments in analog and power technologies including DC-DC converters, AD-DC converters, power supplies, op amps, batteries and more. Microcontroller Watch. (11/14) This newsletter keeps you up-to-date on latest microcontroller news. In this section, we examine the microcontrollers along with their associated tools and support products. IoT Technology Focus. (11/21) Covers what’s happening with Internet-of-Things (IoT) technology–-from devices to gateway networks to cloud architectures. This newsletter tackles news and trends about the products and technologies needed to build IoT implementations and devices. Embedded Boards. (11/28) This newsletter content focuses on both standard and non-standard embedded computer boards that ease prototyping efforts and let you smoothly scale up to production volumes. Developers now have the flexibility to customize 25 common system-level functions including timers, input/output expanders, system reset controllers, electrically erasable programmable read-only memory (EEPROM) and more, using a library of code examples. A common core architecture, a tools and software ecosystem, and extensive documentation including migration guides make it easy for developers to choose the best MSP430 value line sensing MCU for each of their designs. 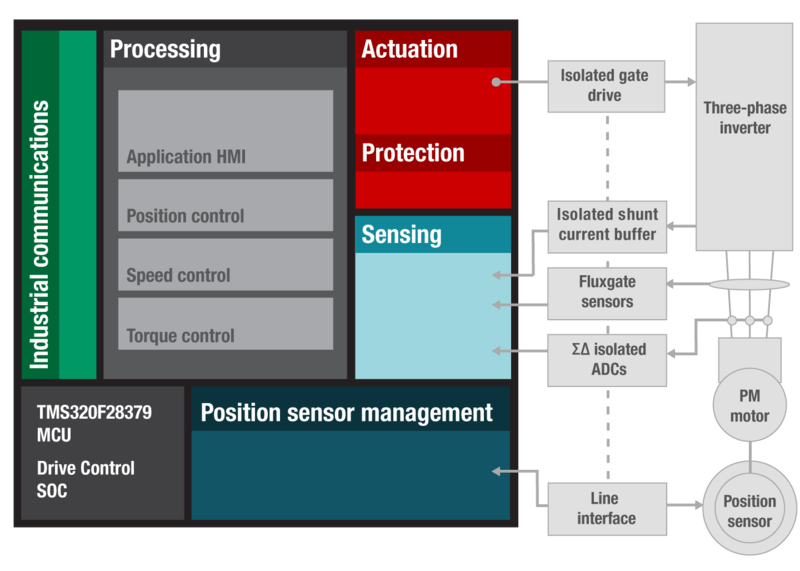 Designers can scale from the 0.5-kB MSP430FR2000 MCU to the rest of the MSP430 sensing and measurement MCU portfolio for applications that require up to 256 kB of memory, higher performance or more analog peripherals. The new MSP430FR2000 and MSP430FR2100 MCUs (with 0.5 kB and 1 kB of memory, respectively) and the new development kit join the MSP430 value line sensing family which includes the MSP430FR2111, MSP430FR2311, MSP430FR2033, MSP430FR2433 and MSP430FR4133 microcontroller families and their related development tools and software. Developers can purchase the value line sensing portfolio through the TI store, priced as low as US$0.29 in 1,000-unit quantities and US $0.25 in higher volumes. Additionally, the new MSP430FR2433 LaunchPad development kit (MSP-EXP430FR2433) is available from the TI store and authorized distributors for US $9.99. Today through Dec. 31, 2017, the TI store is offering the LaunchPad kit for a promotional price of US $4.30. 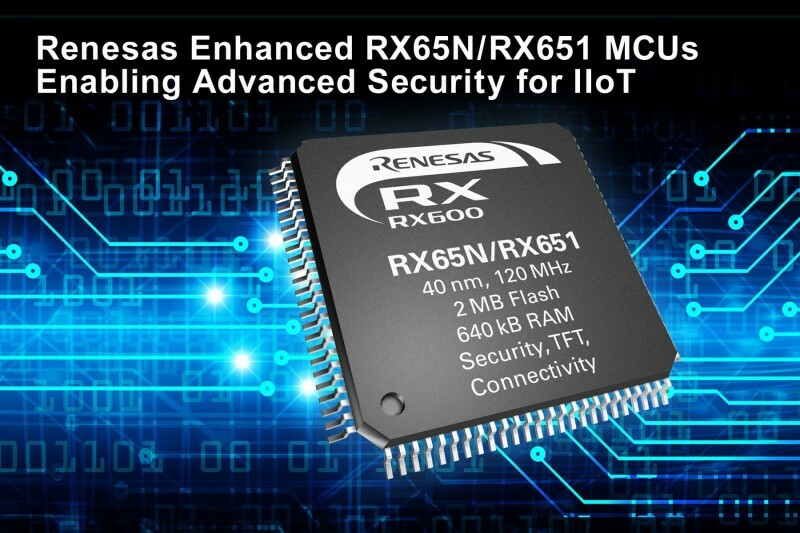 Renesas Electronics has announced the expansion of its RX65N/RX651 Group microcontroller lineup that addresses advanced security needs for connected devices operating in industrial automation, building automation, and smart metering systems. The expanded lineup features MCUs with integrated Trusted Secure IP, and enhanced, trusted flash functionality and human-machine interface (HMI) for industrial and network control systems. The expansion of devices operating at the edge of the Industrial Internet of Things (IIoT) has increased system manufacturers’ need for secure network connectivity and reliability, including secure on-the-go firmware updates. The expanded RX65N/RX651 devices support these evolving security and reprogrammability needs, offering integrated Trusted Secure IP, enhanced flash protection, and other technology advancements to create a secure and stable integrated solution far above others in the market, as proven by the Cryptographic Algorithm Validation (CAVP) certification. In turn, these security advancements enable seamless flash firmware updates in the field through secure network communications. The Trusted Secure IP received the CAVP certification, which ensures the customer will use a device with a high security level. Design engineers are often asked to integrate small thin-film-transistor (TFT) displays into their IoT edge devices or system control applications. These displays allow users to monitor machine behavior through a modern low-cost HMI solution. The RX65N/RX651 is an ideal solution for controlling these displays as it features an embedded TFT controller and an integrated 2D graphic accelerator to provide advanced graphics features and high-performance applications. Selecting a WQVGA display size allows the large 640 KB of on-chip RAM to be used as display frame buffer, which saves external RAM, ensuring a cost-optimized design. Compared with other IoT devices, industrial applications are designed for long-term operation, which involves unique and sometimes challenging requirements, such as firmware updates in the field. The new RX65N/RX651 MCUs feature dual bank flash integration supporting both BGO (Back Ground Operation) and the SWAP function, making it easier for system and network control manufacturers to execute in-the-field firmware updates securely and reliably. Firmware Integration Technology (FIT) is a holistic concept that emphasizes the embedded peripheral function module drivers and portability improvement between the RX65N/RX651 MCUs. The technology aims to lighten the burden of program development and resource management in software development using the entire family of RX MCUs. FIT provides a common application program interface for peripheral drivers and middleware for RX family, based on a solid Board Support Package, which controls the common information for these functions like initial MCU, clock, and board settings. FIT is available for all RX devices and fully integrated into the development environment. Renesas has expanded its robust RX tool infrastructure to help engineers jump start their development work. The new Envision Kit provides an evaluation environment that allows engineers to easily benchmark MCU performance and start developing their own software. 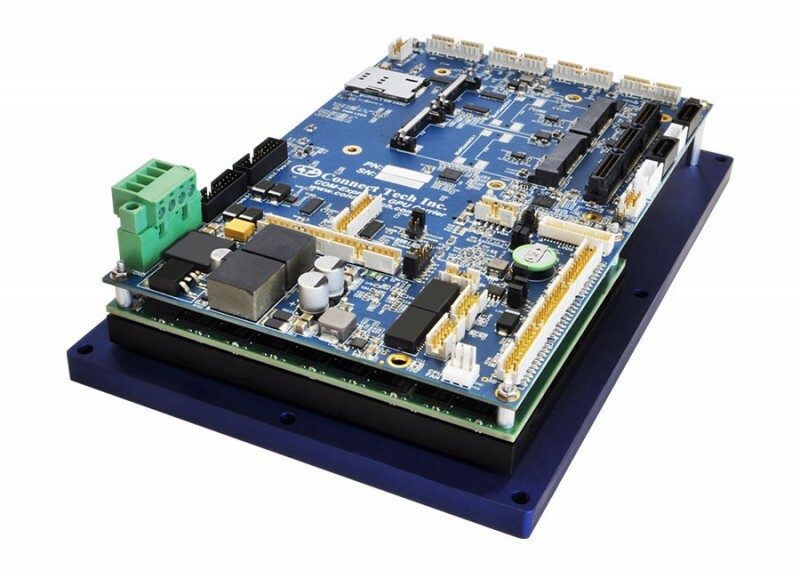 The new RX65N Renesas Starter Kit (RSK) includes a development board with MCU, display, on-chip debugger, trial Renesas C compiler and Integrated Development Environment (IDE), enabling engineers to get their evaluations and development up and running within a matter of minutes. To jumpstart their display designs, RX users can also leverage several ecosystem partner tools, including easy-to-use graphic GUI tools. TDK has announced new miniaturized EPCOS MEMS pressure sensor dies. The automotive versions of the C33 series boast dimensions of just 1 mm x 1 mm x 0.4 mm. They are designed for absolute pressures of 1.2 bar to 10 bar and are qualified based on AEC-Q101. The typical operating voltage is 3 V. With a supply voltage of 5 V they offer sensitivities of between 15 mV/bar and 80 mV/bar, depending on the type. The miniaturized pressure sensors are suitable for a temperature range from -40 °C to +135 °C and can even withstand 140 °C for short periods. 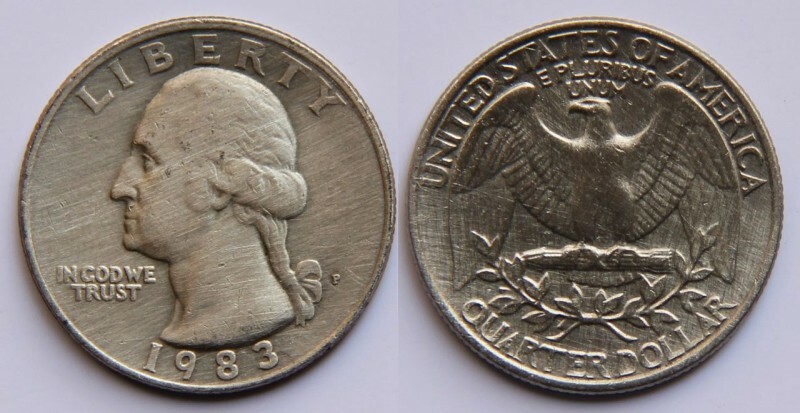 They also offer a very long-term stability of ± 0.35% FS (full scale). The C39 type, with its footprint of just 0.65 mm x 0.65 mm is especially suitable for IoT and consumer applications. One noteworthy feature of the C39 is its low insertion height of just 0.24 mm, which makes the low-profile MEMS pressure sensor die ideal for applications in smartphones and wearables, for example, where space requirements are critical. The C39 is designed for an absolute pressure of 1.2 bar and, like the C33 series, offers long-term stability of ± 0.35% FS. All the pressure sensor dies operate on the piezoresistive principle and deliver, via a Wheatstone bridge, an analog signal that is proportional to the applied pressure and the supply voltage. 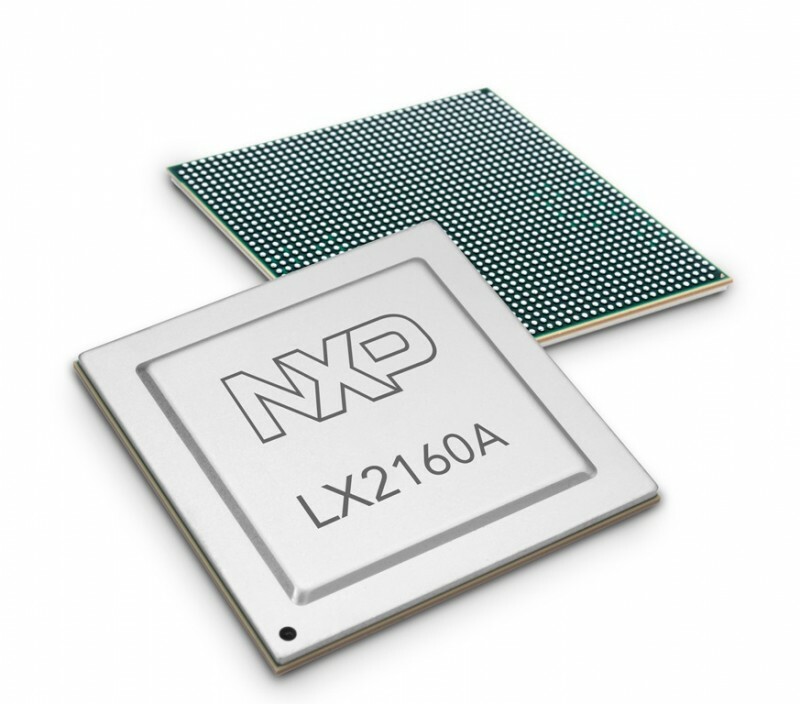 NXP Semiconductors has announced the highest performance member of its Layerscape family, the LX2160A SoC. The LX2160A is specifically designed to enable challenging high-performance network applications, network edge compute, and data center offloads. Trusted and secure execution of virtualized cloud workloads at the edge is driving new distributed computing paradigms. 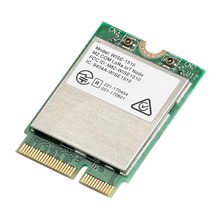 The LX2160A features sixteen high-performance Arm Cortex-A72 cores running at over 2 GHz in a sub 30 W power envelope, supporting both the 100 Gbit/s Ethernet and PCIe Gen4 interconnect standards. In addition, it provides L2 switching at wire rate and includes acceleration for data compression and 50 Gbit/s IPSec cryptography. NXP supports and drives the rich ARM ecosystem for virtualization, building on the foundations of open source projects for cloud and network function virtualization including Open Daylight, OpenStack, and OP-NFV. NXP Arm processors incorporate hardware for virtualization technologies such as KVM and Linux containers and hardware acceleration of network virtualization. NXP also supports industry-standard APIs for virtualization, including DPDK, OVS, and Virtio, and standard enterprise Linux distributions, such as Debian and Ubuntu. Silicon samples and a reference board will be available in Q1 2018. We work pretty far in advance to get Circuit Cellar produced and in your hands on-time and at the level of quality you expect and deserve. Given that timing, as we go to press on this issue we’re getting into the early days of fall. In my 27 years in the technology magazine business, this part of the year has always included time set aside to finalize next year’s editorial calendar. The process for me over years has run the gamut from elaborate multi-day summer meetings to small one-on-one conversations with a handful of staff. But in every case, the purpose has never been only about choosing the monthly section topics. It’s also a deeper and broader discussion about “directions.” By that I mean the direction embedded systems technologies are going in—and how it’s impacting you our readers. Because these technologies change so rapidly, getting a handle on it is a bit like jumping onto a moving train. A well thought out editorial calendar helps us plan out and select which article topics are most important—for both staff-written and contributed articles. And because we want to include all of the most insightful, in-depth stories we can, we will continue to include a mix of feature articles beyond the monthly calendar topics. Beyond its role for article planning, a magazine’s editorial calendar also makes a statement on what the magazine’s priorities are in terms of technology, application segments and product areas. In our case, it speaks to the kind of magazine that Circuit Cellar is—and what it isn’t. An awareness of what types of product areas are critical to today’s developers is important. 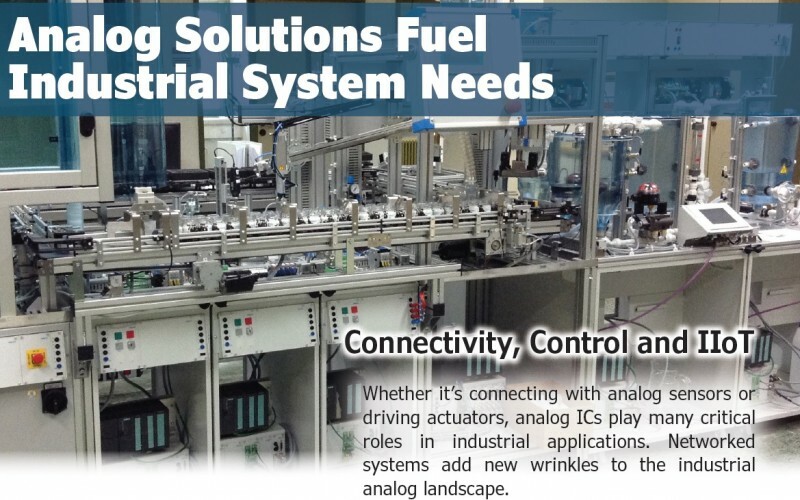 But because Circuit Cellar is not just a generic product magazine, we’re always looking at how various chips, boards and software solutions fit together in a systems context. This applies to our technology trend features as well as our detailed project-based articles that explore a microcontroller-based design in all its interesting detail. On the other hand, Circuit Cellar isn’t an academic style technical journal that’s divorced from any discussion of commercial products. In contrast, we embrace the commercial world enthusiastically. The deluge of new chip, board and software products often help inspire engineers to take a new direction in their system designs. New products serve as key milestones illustrating where technology is trending and at what rate of change. Part of the discussion—for 2018 especially—is looking at how the definition of a “system” is changing. Driven by Moore’s Law, chip integration has shifted the level of system functionally at the IC, board and box level. We see an FPGA, SoC or microcontroller of today doing what used to require a whole embedded board. In turn, embedded boards can do what once required a box full of slot-card boards. Meanwhile, the high-speed interconnects between those new “system” blocks constantly have to keep those processing elements fed. The new levels of compute density, functionality and networking available today are opening up new options for embedded applications. Highly integrated FPGAs, comprehensive software development tools, high-speed fabric interconnects and turnkey box-level systems are just a few of the players in this story of embedded system evolution. Finally, one of the most important new realities in embedded design is the emergence of intelligent systems. Using this term in a fairly broad sense, it’s basically now easier than ever to apply high-levels of embedded intelligence into any device or system. In some cases, this means adding a 32-bit MCU to an application that never used such technology. At the other extreme are full supercomputing-level AI technologies installed in a small drone or a vehicle. Such systems can meet immense throughput and processing requirements in space-constrained applications handling huge amounts of real-time incoming data. And at both those extremes, there’s connectivity to cloud-based computing analytics that exemplifies the cutting edge of the IoT. In fact, the IoT phenomenon is so important and opportunity rich that we plan to hit it from a variety of angles in 2018. Those are the kinds of technology discussions that informed our creation of Circuit Cellar’s 2018 Ed Cal. Available now on www.circuitcellar.com, the structure of the calendar has been expanded for 2018 to ensure we cover all the critical embedded technology topics important to today’s engineering professional. Technology changes rapidly, so we invite you to hop on this moving train and ride along with us. 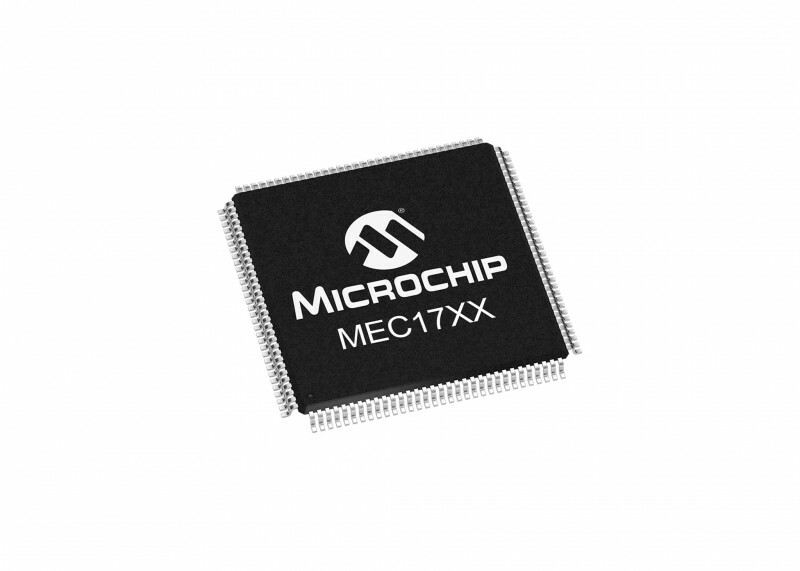 Microchip Technology has made available its MEC17XX and MEC14XX families of embedded controllers with enhanced Serial Peripheral Interface (eSPI). The eSPI bus is the host interface supported by the latest PC computing chip sets and is required for new, upcoming computing applications. The MEC17XX family is based on an ARM Cortex-M4F core and has advanced hardware-accelerated cryptography algorithms to efficiently support the secure boot of a computer. The family offers several additional features including two UARTS and an extended industrial operating temperature range that make the family ideal for industrial computing. In addition, Microchip’s popular MIPS-based MEC14XX family has been expanded to include functionality for supporting the new eSPI Slave Attached Flash (SAF) feature, which allows the Microchip embedded controller to be directly connected to an SPI Flash memory using an on-board master controller. 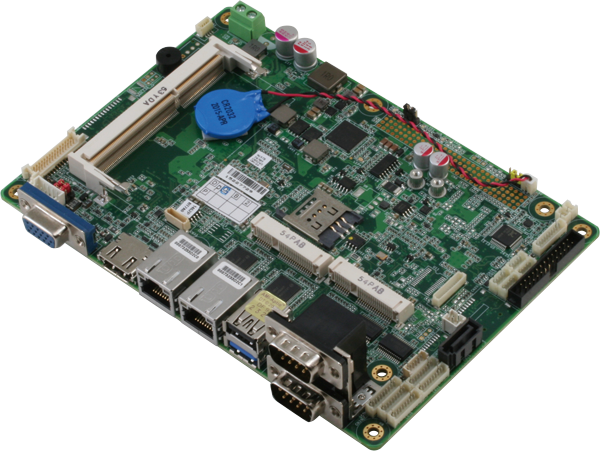 These new embedded controllers are part of an expanded family of devices that have been an integral part in the computing industry’s transition from LPC to eSPI. The MEC17XX adds security through cryptography functionality to advance secure boot, a security feature developed to ensure a system boots only from software that is trusted by the manufacturer. Furthermore, the addition of two UARTS and support for industrial temperature is necessary for industrial computing applications. The latest members of the MEC14XX family add a new level of design functionality for computing engineers by adding SAF, which is an optimal solution for USB Type-C power delivery. The latest MEC1428 devices are pin and register compatible with the MEC140X and MEC141X families, which allows designers to easily add eSPI and additional features and have more flexibility in their designs. Both families retain eSPI Master Attached Flash (MAF) capability. All of Microchip’s computing embedded controllers are supported by a variety of development and debug tools and evaluation boards, plus datasheets and other documentation. The eSPI interface has numerous benefits including allowing for multiple input/output signals to be configured to support either 3.3 V or 1.8 V, which reduces the system cost by eliminating the need for external voltage translators. These features allow for seamless migration of intellectual property (IP) across multiple x86 computing platforms including those based on Intel’s Atom processors, Intel’s iCore processors and Ryzen processors from AMD. The four-part MEC17XX family is available in a variety of WFBGA package options, starting at $2.59 each in 10,000 unit quantities. The family features industrial-qualified parts as well as the option of additional EEPROM memory. The MEC1428 is available today in a variety of package options, starting at $2.16 each in 10,000 unit quantities. Telit has announced it is collaborating with Wind River, an Intel company, to accelerate Industrial IoT (IIoT) adoption. Through this relationship, Telit and Wind River are reducing the complexities of IoT device management, helping companies quickly and securely realize the full solution benefits of IIoT. 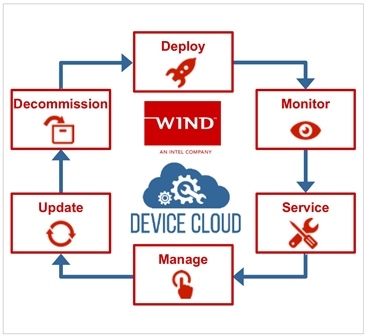 Wind River is using Telit’s IoT platform technology for its device management platform. The latest release of Wind River Helix Device Cloud is making it easier for companies to capture data on-premise or in the cloud, providing enhanced system analytics and remote device management. By allowing users to aggregate and perform computing tasks, Device Cloud helps perform informed business intelligence to protect investments, utilize infrastructure, improve processes and generate new revenue streams. Telit’s deviceWISE platform offers a set of connectivity management, device management, data management, edge, cloud and enterprise ready-to-use connectors and services that reduce the risk and time-to-market of connecting ‘things to apps,’ by collecting, managing,and analyzing critical device data. Texas Instruments has introduced a 16-V input, 40-A synchronous DC/DC buck converter with an internally compensated advanced-current-mode (ACM) control topology supporting frequency synchronization. 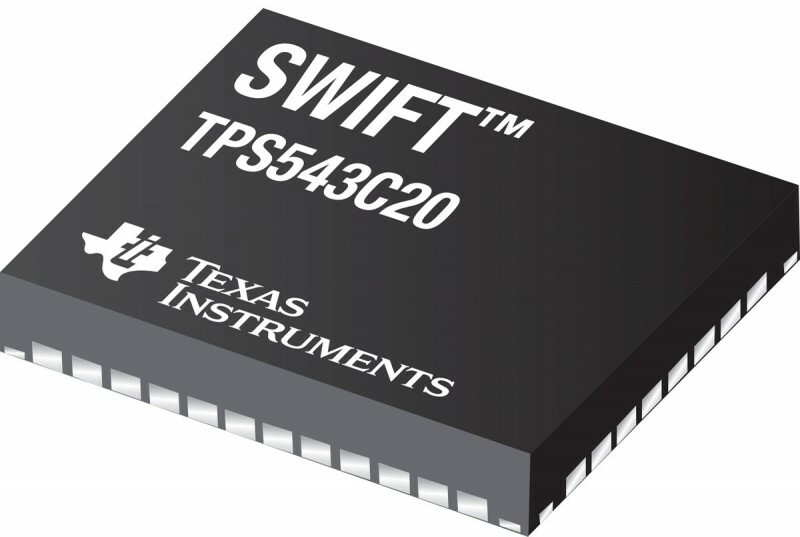 TI’s TPS543C20 SWIFT converter provides enhanced efficiency by integrating its latest generation of low resistance high- and low-side MOSFETs into a thermally efficient small-footprint package. Designers can stack two converters side by side to drive loads up to 80 A for processors in space-constrained and power-dense applications in various markets, including wired and wireless communications, enterprise and cloud computing, and data storage systems. The unique internally compensated ACM control topology with fast transient response maintains stability over a wide range of input and output voltages. What makes ACM different is that it is an emulated peak-current-mode control topology that internally generates a ramp with the ability to dynamically adjust for stability over a wide range of operating switching frequencies. This provides the best of both traditional fixed frequency for low noise operation and constant on-time (COT) control for fast transient without external compensation. 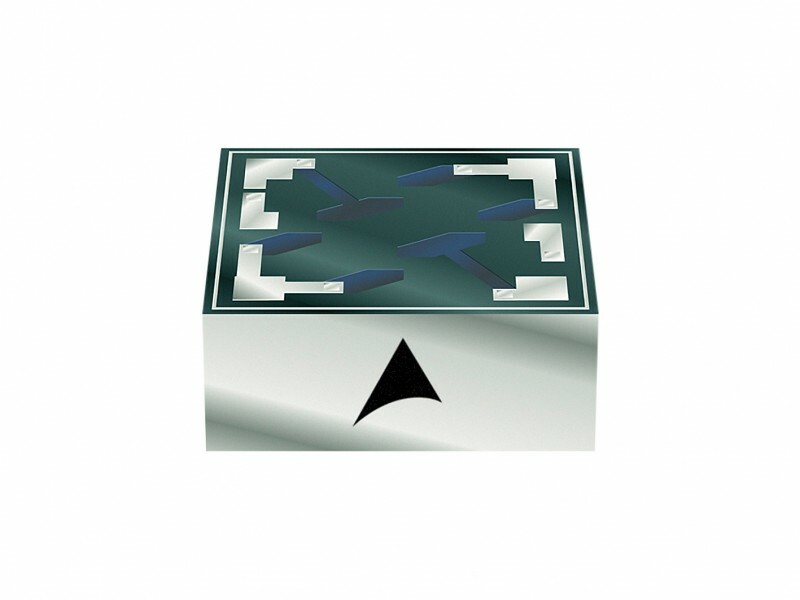 Provides greater than 90 percent efficiency at a 40-A peak-load current. Maintains 0.5 percent reference-voltage accuracy over temperature and full differential remote-voltage sensing to meet the voltage-accuracy requirements of deep submicron processors. Provides up to 80 A at point-of-load when stacking two converters. Offers very high power density and the PowerStack quad flat no-leads (QFN) package enables easy heat sinking from the single ground pad. Available now from through the TI store and authorized distributors, the TPS543C20 is offered in a 40-pin, 5-mm-by-7-mm-by-1.5-mm PowerStack QFN package and is priced in small reels at US$5.24 for 1,000-unit quantities. Cypress Semiconductor has announced the public release of the PSoC 6 BLE Pioneer Kit and PSoC Creator Integrated Design Environment (IDE) software version 4.2 that enable designers to begin development with the PSoC 6 microcontroller (MCU) for IoT applications. PSoC BLE 6 is the industry’s lowest power, most flexible MCU with built-in Bluetooth Low Energy wireless connectivity and integrated hardware-based security in a single device. 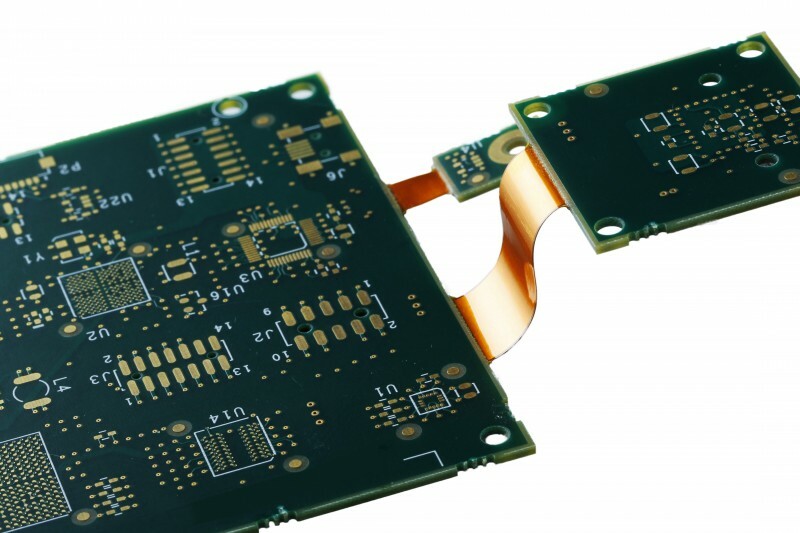 Early adopters are already using the flexible dual-core architecture of PSoC 6, using the ARM Cortex-M4 core as a host processor and the Cortex-M0+ core to manage peripheral functions such as capacitive sensing, Bluetooth Low Energy connectivity and sensor aggregation. Early adopter applications include wearables, personal medical devices and wireless speakers. Designers are also utilizing the built-in security features in PSoC 6 to help guard against unwanted access to data. 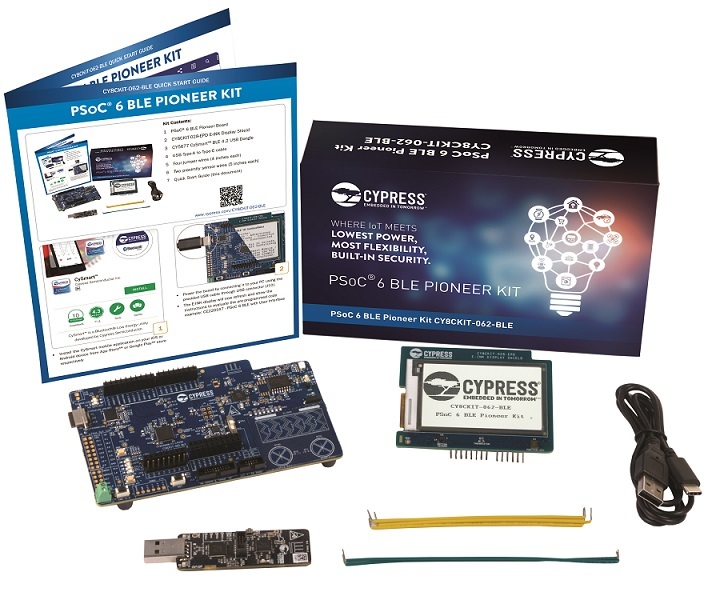 The PSoC BLE Pioneer Kit features a PSoC 63 MCU with Bluetooth Low Energy (BLE) connectivity. The kit enables development of modern touch and gesture-based interfaces that are robust and reliable with a linear slider, touch buttons and proximity sensors based on the latest generation of Cypress’ industry-leading CapSense capacitive-sensing technology. Designers can also use the board to add USB Power Delivery (PD) with its Cypress EZ-PD CCG3 USB-C controller. The kit also includes a 2.7-inch E-ink Display Shield add-on board (CY8CKIT-028-EPD) with thermistor, digital mic, and 9-axes motion sensor. Offering best-in-class flexibility and ease-of-use, the PSoC 6 MCU architecture can serve as the catalyst for differentiated, visionary IoT devices. Designers can use software-defined peripherals to create custom analog front-ends (AFEs) or digital interfaces for innovative system components such as E-ink displays. The architecture is supported by Cypress’ PSoC Creator IDE and the expansive Arm ecosystem. Designers can find more information about PSoC Creator at http://www.cypressw.com/creator. The PSoC 6 BLE Pioneer Kit (CY8CKIT-062-BLE) is available for purchase for $75 at the Cypress Online Store and through select distribution partners. PSoC 6 devices are currently sampling. Production devices are expected by the end of 2017.